For centuries, tea has held a valued place in both Eastern and Western cultures. From the ritual of a Japanese tea ceremony to the cozy informality of an English cuppa at the kitchen table, tea (whether green, black, white or herb) soothes, grounds and comforts us. It's no surprise that so many of us switch the kettle on at the first sign of trouble - keep calm and drink tea! In fact, that's how this book came about. After a particularly stressful week, editor Anouska Jones was sitting at home with her husband complaining about everything that had gone wrong. As he put their teapot and two mugs down on the table, her husband commented, "Cheer up! 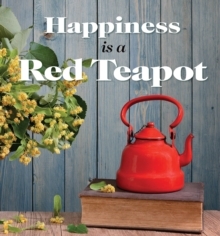 You can't be miserable when you've got a bright red teapot in front of you!" The very next morning, Anouska started researching quotes about tea and before long she had a collection of memorable quotations from rock stars (Mick Jagger, Rod Stewart), Buddhist monks (Thich Nat Hahn), politicians (Abraham Lincoln, William Gladstone), actors (Audrey Hepburn, Billy Connolly), adventurers (Bear Grylls) and more. It seems tea's appeal is truly universal! It's hoped that the resulting book of quotes and accompanying photographs brings you the same pleasure as a perfectly brewed cup of your own particular favorite.